Every major election in the U.S. produces a steady drumbeat of calls from scholars and interested observers for a solution to the problem of citizens’ political apathy. Turnout is abysmal and thoughtful individuals want to fix it. However, this focus on turnout overlooks the fact that democratic governance does not simply rely on participation. It relies on quality participation. Theorists and philosophers since Plato and Rousseau have debated the viability of democratic governance for centuries This debate has never centered on whether citizens will show up to vote, but on whether they are capable of casting an intelligent vote when they do. Unfortunately, there is ample reason to suspect that they are not, and the popular belief remains that large segments of the American population do not know what is in their best interest and support, through voting, the wrong candidates – so-called ‘incorrect voting’. Despite the critical importance of quality political engagement and abundant reasons to doubt citizens’ political acumen, research on mass political behavior rarely attempts to measure the quality of individuals’ political participation, much less explain its causes. 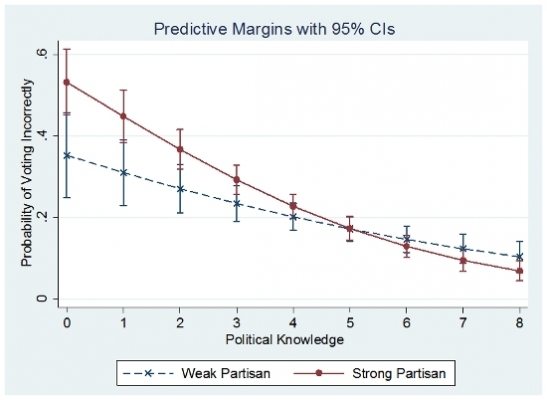 In new research I find that when choosing between presidential candidates, strong partisans with low-information are more likely to vote incorrectly than weak partisans with similar levels of low-information. I also find that low-information voters who think that the economy is doing better for them are much more likely to vote against their interests. I fill this void by implementing a new method of measuring the quality of voting I refer to as Self-identified Incorrect Voting (SIV). The SIV method stands firmly on the foundation built by the works of, others who have produced some of the first attempts to measure correct/incorrect voting. The SIV method works by, first, assessing whom respondents voted for in the actual election and then, later in the survey, presenting them with two sets of policy positions stripped of the candidates’ names and party affiliations. The respondents are then asked to indicate which set of policy positions they prefer. Thus, a comparison of this preference to the candidate they voted for in the election provides the measure of whether the respondent voted correctly. The value of this process is that it allows respondents to determine for themselves if they voted correctly. Every other attempt to measure the quality of voting has included a component where the researcher has to figure out how voters weigh the importance of various issues. With the SIV method, voters do this themselves when they examine the sets of issue positions. If respondents are single issue voters, they can base their choice on that one issue and ignore the rest. If they care about all issues equally, they can average across all the issues and base their choice on that too. No matter how respondents understand, weigh, and incorporate various considerations in order to produce a choice, this method allows it. I demonstrate the value of the SIV method by administering a national survey after the 2012 U.S. Presidential election and use it to test claims by some scholars that the ignorance of average citizens is inconsequential because voters are able to utilize political cues and their own experiences to vote “as if” they were highly knowledgeable. Thus, polls like this Pew Research Center poll which finds that barely half of Americans know that Common Core refers to school curriculum standards, are not a problem because specific knowledge like this is unnecessary when political cues are available to solve people’s information deficiencies and lead them to the proper candidate. The two most commonly referenced voting cues are partisanship and the state of the economy. If cues are as helpful as some suggest, they should help low-information voters behave like high-information voters when choosing a presidential candidate. What do I find? Figures 1 and 2 show results of my research. In the survey I measured respondents’ political knowledge with eight knowledge questions about U.S. politics (for example, which party controls the U.S. House of Representatives?). The supposition is that partisanship will help low-information voters. If this is the case, than the most likely place to find this effect is among the strongest partisans, but that is not what I find. 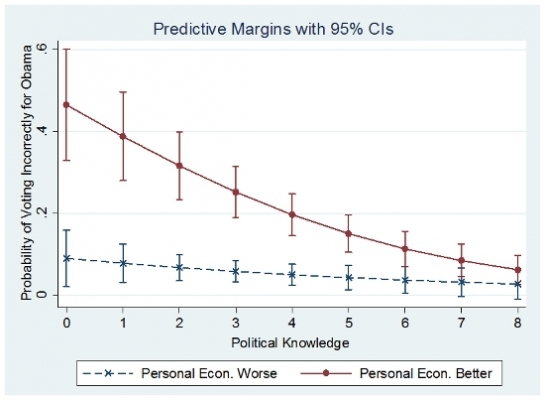 Looking at Figure 1, the political knowledge scale runs from least (0) to most (8) knowledgeable. The two lines represent weak (x line) and strong (circle line) partisans. If partisanship helps, the circle line should be below the x line at the lower end of political knowledge (scores 0 to 2). This would mean the strong partisans are less likely to vote incorrectly than weak partisans. However, this is not the case. The results actually show that low-information, strong partisan voters are more likely to vote incorrectly than low-information, weak partisans. Thus, not only does partisanship not help low-information voters, it actually hurts them. And in either case, low-information voters are much more likely to vote incorrectly than those who are well informed. I also looked at the effect of the economy on voters. The long history of research on the effects of the economy on voting shows that it causes those who think it is doing well to reward the president and those who think it is doing poorly to punish them. But does it help low-information voters behave like high-information voters? Figure 2, once again, suggests that it does not. As can be seen, low-information voters (scores 0 to 3) who think the economy is doing better for them (circle line) are significantly more likely to vote incorrectly for Obama than those who think it is doing worse. Importantly, this effect decreases as one’s level of political knowledge goes up. Apparently, doing better economically causes low-information voters to disregard their policy preferences. All told, the research on the quality of citizen participation is surprisingly thin, given the depth and breadth of the philosophical debate on the viability of democracy. Here I have provided a relatively simple method for scholars to measure this concept without imposing their own beliefs about how people “should” weigh political issues. Once we can properly measure specific instances where individuals fail to participate correctly, we can begin to understand the causes of such failures and then work toward finding solutions that can mitigate their effects. This article is based on the paper ‘Incorrect voting in the 2012 U.S. presidential election: How partisan and economic cues fail to help low-information voters’, in Electoral Studies. Aaron Dusso – Indiana University-Purdue University IndianapolisAaron Dusso is an Assistant Professor in the Department of Political Science at Indiana University-Purdue University Indianapolis and a core faculty member of Indiana University’s Center for Civic Literacy. His primary research is on the intersection of political psychology and citizen knowledge and engagement. He is currently finishing a book manuscript on the Big Five personality traits’ effect on citizens’ capacity to understand abstract notions like ideology; know basic facts about important political issues; ability to connect their personal policy preferences to the political party that best represents those interests; and likelihood of holding hypocritical policy preferences where they benefit from “submerged” or “hidden” welfare programs like home mortgage interest tax deductions, while opposing visible programs like food stamps. This article was originally posted as a blog on The London School of Economics and Political Science and is re-published here with the author’s permission.